Last week, I experienced wearing special kimonos. 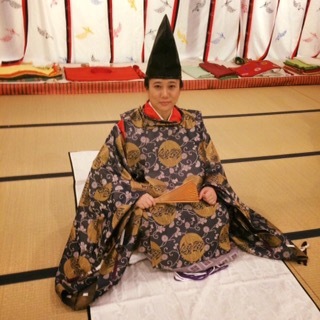 One is called junihitoe (十二単), multi-layered kimono for court ladies – this is still worn by imperial families on special occasions like their wedding ceremonies. Another one is Kariginu (狩衣), informal clothes worn by nobles when they went hunting in the old time. Unlike normal kimonos, it is not really easy to have an opportunity to wear these clothes. This time, I had the luck to know a lady who mastered “emon-do (衣紋道)”, special dressing skills and manners to help someone wear this kimono, and she kindly invited me to experience this. Not only just wearing these kimonos, I could learn how the nobles in the old time behaved. For example, court ladies in junihitoe could not show their faces, ears and hands in front of people. They used a big fan to cover the face. Men could show their faces, but instead they had to cover their heads with special hats. It is said that they did not even take them off in their bed rooms. She is hoping to introduce this experience to visitors from abroad too. If you are interested, please contact me. Then I can tell you more details (dates, venue, how to apply, etc.). 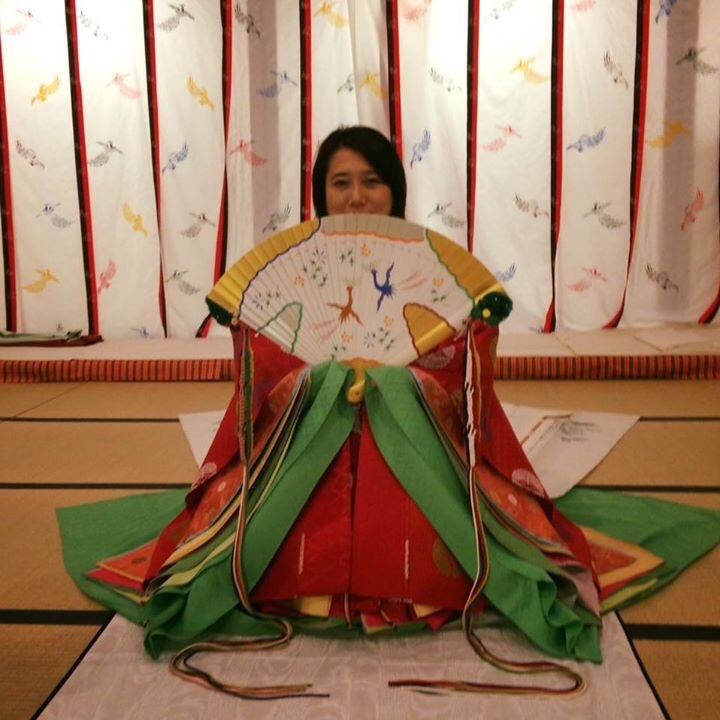 Or if you understand Japanese language, you can also check the website of Saitama Prefectural Museum of History and Folklore as well, where her group is providing this experience several times a year. I’m sure it will be a very special experience for you!